It's Facilities Manager's turn for a blog post. Here we go with facilities-type stuff, namely, stumps and clumps. Hold on to your seat, it's a thrilling, behind-the-scenes look at what goes on around here to get this place into shape. In May 2017 we hired someone to clear and then move maple, fir and filbert stumps from the southeast quarter of the property. That area is now host to our fruit orchard, vegetable garden and the berry patch. As requested, Frank created a huge pile of stumps and root-clumps just up-slope from the orchard. Tamara wanted to keep the giant root pile as it was as a garden sculpture, but I had other designs in mind. The goal is to remove this pile to make room for a greenhouse (someday). This is right after Frank moved these stumps last spring. Facilities Manager is pleased with the pile, but now the work begins. The chair is to show the size of the pile. Oh boy! Fast forward to now. This is what was left as of last week. Determination and patience have won the day on this project. In the background against the hedgerow are a few stumps I managed to move to let them decompose in place to make Tamara happy. Initially overwhelmed by the pile I started tearing it apart last fall. I used a chainsaw and a tool I know as a hoe-dag, which is like an axe but one side of the head is a small hoe-blade. Very useful for this project. I pulled and sometimes pried or chopped clumps of roots or whatnot, and then I simply tossed them on the next trash-wood fire I executed nearby. Since the recent rains keep our gardening at low levels I focused on the stump pile. Here below are cut and sorted pieces ready for the fire. This is the bottom of a filbert tree or "clump." I used a winch attached to a tree to pull the clump over. I then cleaned the dirt from it with the hoe-dag. It is ready for the fire pile. This towering red fir stump is about seven feet tall. I plan to burn it where it stands. It was in the ground as a stump at least 20 years before Frank moved it uphill. So far the red fir stuff has burned well. Still full of pitch. This is one of the big maple stumps. Heavy and kind of spooky. Check out the tall red fir stump back there. Scary! The small filbert clumps are cleaned and lined up for the fire pile. That last chunk of filbert clump is the lone survivor hiding in this pile. You can see my chainsaw in the foreground. Behind there you can see I started digging out the old fir stump where I started this burn pile last year. 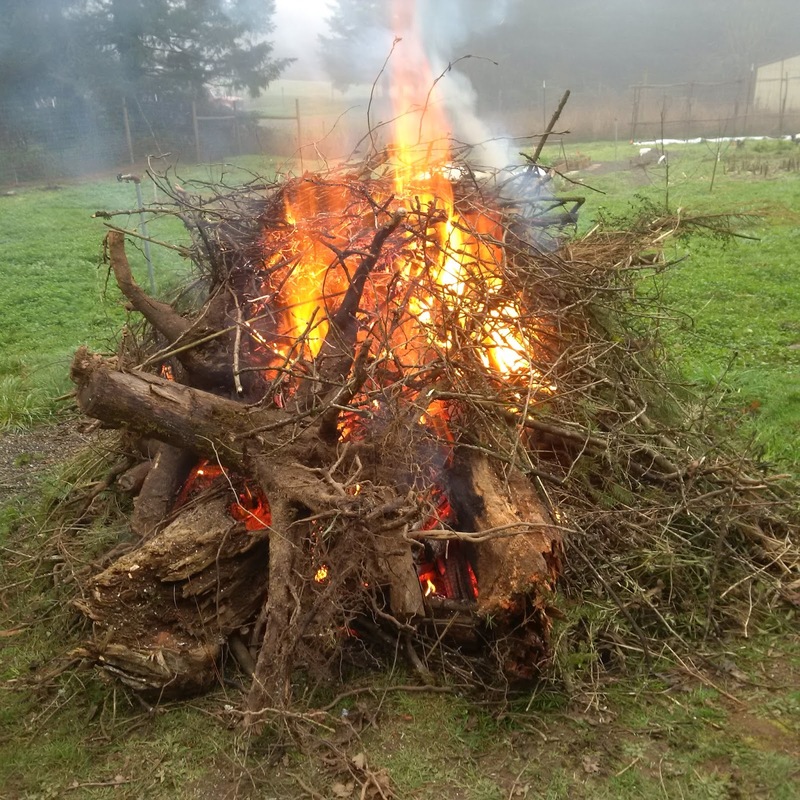 My intention was to burn the fir stump, but the fire piles migrated slowly away from the stump. So I had to dig it out with a shovel, the chainsaw and a long, iron bar. Oh, so much fun (and one hell of a workout). The resulting stump. We kind of like it. I see a turtle or a large land-dinosaur crawling across the clover. Scary! I think we'll keep it, Tamara wants to move it to the shade garden and let it decompose in place. At least let her have a small piece of the pile as sculpture! The end result as of Monday morning. The line-up of smaller stumps and clumps has vanished and the land is looking tidier. Last note: We've been working on getting the vegetable garden ready for the season. Seeds are sprouting in the garage under lights and the land is being prepared. Thanks to our dear neighbor Mike (a heavy equipment mechanic) our rototiller is working as it should. Seemed the pins connecting the drive shaft to the wheels were not properly installed. No wonder it was a son-of-a-gun to manhandle around. 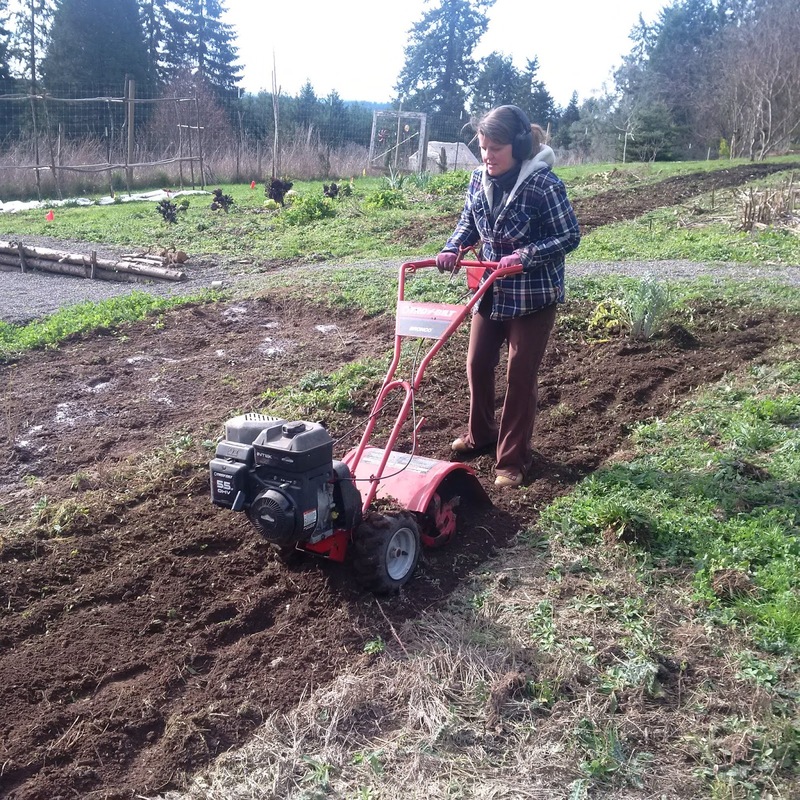 With the fix, though, the drive wheels chug along with Tamara attached and happy in the artichoke plot. Thanks, Mike! We have much to learn about farm living. Neighbors like Mike make it a pleasure. I am proud to have narrowed the stump and clump project down from a seemingly overwhelming pile of wood to just four or five large stumps. I plan to turn those over with the winch, clear the dirt away and cut away the major roots with the chainsaw. I foresee one or two cores that I cannot chainsaw apart, so I will find a use for them around the farm. They may look like beanbag chairs for all I know, but at least if you sit on them they won't pop and spray foam peanuts all about! Finally, stump and clump removal is hard, heavy work. But at the end, much like Tamara knows in growing some of her small, delicate plants, it requires effort and consistency to make something beautiful. This is Facilities Manager signing off for now. Until I write again, happy gardening. Thank you, Facilities Manager - without your hard work none of this would be possible. Happy gardening, everyone! Hi, Kris. FM here. I mark it down to good exercise. If I stopped and thought about how much effort is involved, gosh, I think I'd be moving to Queensland to count fruit bats! I do love a good bonfire! Heroic effort on your part, FM. Hi, Rickeye. FM here. You are invited to the next big fire, for sure. Super smores on the menu! Your clean-up is quite an accomplishment, FM. Maybe some of those remaining stumps can be put together to form a stumpery in the shade garden, a perfect place for ferns. Next time you are in Federal Way, stop by the Rhododendron Species Foundation and check out the Hardy Fern Foundation's stumpery. Some people would pay to have problem like yours! I love the crawling stump! I'm glad you decided to keep it. Also happy to hear there might be a greenhouse in your future. You won't regret it. Get the biggest one you can afford. Hi, Alyson. FM here. Thanks for the stump info. We will watch for any stumperys tonight as we view "Victoria." Haha. I overturned the two maple stumps yesterday and the last big filbert clump. I know what I am doing Monday and Tuesday, i.e., pecking out dirt and chainsawing! Fun! The stump graveyard was very spooky, on a dark foggy all hallows eve they would have been most effective. Stump work is hard but they won't be back any too soon !